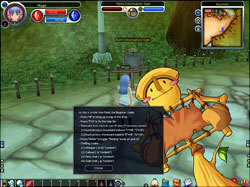 When you first enter the game in Roumen, Remi is waiting to assist you as you first begin your journey through Fiesta. Talk to her and listen to what she has to say. Her Tutorial Quest will help you learn the basics of playing Fiesta. Follow her instructions carefully and soon you will be ready to begin your adventure. All around Isya, Information Signs are posted for you. Hover over them with your mouse until a chat bubble icon appears on your screen. Click on them and read what they have to say. They are useful means of information as you venture forth through the lands of Isya. As a young adventurer you constantly have to prove yourself to the people of Isya. You also may want to get on their good sides so as to gain new knowledge, acquire new skills, and make new friends. Sometimes helping out can get you some great rewards, and the experience is always great. As you level up more and more quests become available to you, and the rewards increase as well. On the upper-right hand part of your screen, to the left of you mini-map, a Quest Notice icon will appear when there is an available quest for you. Clicking on the icon will tell you where you need to go to find your next task. If you explore around town, you will see some NPC's with a glowing, floating ‘Q‘ above their heads. The ‘Q‘ means that they have a quest waiting for you. If the ‘Q‘ is green this means that you have already accepted a quest from that NPC and it is in progress. If the ‘Q‘ turns purple then congratulations, you have completed that quest. If you look at the town map by pressing the shortcut key ‘M', you will notice that the location of each NPC is noted. If the NPC has an orange ‘Q‘ near its icon, then they have a quest for you. If the ‘Q‘ is green then it is in progress. When a quest is ready to be turned back in to the NPC, the ‘Q‘ will turn purple. Once you have turned in your completed quest, the ‘Q‘ will disappear. Be sure to consult your map for new quests. Your Quest log is accessible by pressing the shortcut key ‘L', or clicking on the icon at the bottom-right hand corner of your screen. There you will see all the quests you have accepted and you can track your progress as some quests do require multiple tasks. Load up on as many quests as they come available to you. Some quests may require you to perform the same tasks, or hunt in the same map or area. Some quests are repeatable and the rewards can be very helpful as you play. Look at the rewards and prioritize the quests that can help you the most. Form parties with other players who have similar quests. By helping each other you can complete certain tasks in a minimal amount of time. 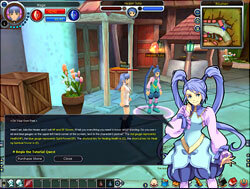 The non-player characters in Fiesta are the primary storytellers, and quest givers of the game. Look to them for information and tasks. Each also has a primary function to assist you on your adventure. Explore, and talk to NPC's to see what they have to offer you. Familiarize yourself with their locations, so you'll have an easy time getting what you need in the future. An NPC can sometimes be your best friend. 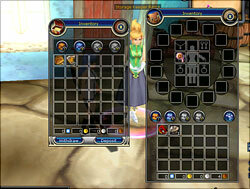 To access your inventory press the ‘I' key or click the Inventory icon in the bottom right hand corner of your screen. 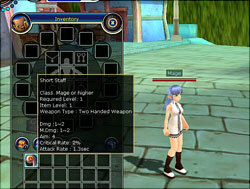 Your inventory is where all the items you pick up are stored. 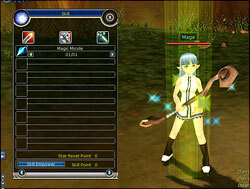 It is also the screen where you can equip the items you wish to use. To equip an item, simply right click on its icon. To unequip your item, right click on the item again. Characters come equipped with a specific amount of HP & SP Stones. These stones can be used by a player to heal their characters and restore spirit points. The stones cool down time is independent of potions and they can be replenished from any town healer for a specific amount of in-game currency. The amount of stones you can carry at any one time increase as you level and can further be increased when special items are purchased from the Fiesta Item Shop. The shortcut key for using an HP stone is the ‘Q' key, and for using an SP stone the ‘E' key. When your HP and SP are too low to continue playing and you don't want to use up your potions, or stones you can simply put your character in rest mode to regenerate your HP and SP. Rest mode can be activated by pressing the ‘Home' key. 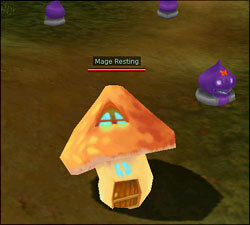 Your character will then change to a mini house, which is shaped like a mushroom and rest. As you gain experience and begin to level, you can purchase and use better houses that will regenerate HP and SP faster. There will be a lot more functions and accessories for your mini house, which can be purchased from our Fiesta Item Shop. When you kill monsters or complete certain quests your character gains experience. After gaining a certain amount of experience your character will level up. As you level you earn stat points to distribute, skill empowerment points, and access to level restricted scrolls, and areas. A character earns 1 stat point per level, and 1 skill empowerment point per level. The chat window is located above the Quick Slot bar in the bottom left hand corner of you screen. To type a message, simply press the enter key to toggle the chat window, type in your message and press the enter key again. To toggle the chat window off, again press the enter key. 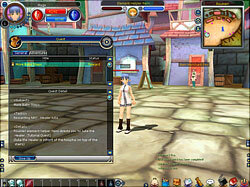 In Fiesta there are more options for chatting with other players. To shout a message in public begin your message with /s. To privately message another player, begin your message with /w followed by the game id to whisper them. and to chat within your guild, begin your message with /g. Each town has a warehouse NPC called the Storage Keeper. By speaking to them you can access your personal storage space, where you can store any items that you pick up as you play. It's a good place to store gathered items, created items, and high-level items you want to save for later. This storage space is the same for all your characters, so you can store items there for your other characters to use. You can also deposit in-game currency here for all your characters to share. While the storage window is open, simply left-click on items in your inventory to store them.